It has been known for a long time in the scientific community that cerium is the best element to employ when splitting water into oxygen and hydrogen — a key method in developing hydrogen gas for fuel. However so far it is not clear why cerium is so successful. Currently a Northwestern Engineering team headed by Chris Wolverton has discovered that cerium’s electronic entropy, which is formed when an electron transitions between several states within an electron shell, is the fundamental reason for its success. This finding could aid researchers in exploiting cerium’s entropy in a more successful manner for water-splitting technologies. In order for water splitting to be fast enough to be practical, you need a large amount of entropy, it turns out that cerium is magic for entropy. 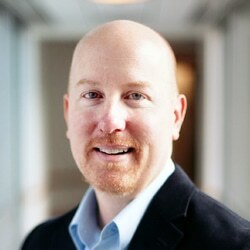 Chris Wolverton, professor of materials science and engineering in Northwestern’s McCormick School of Engineering. The research, supported by the US Department of Energy, was just published in Nature Communications. Shahab Naghavi, a postdoctoral fellow in the Wolverton Research Group, was the paper’s first author. Since the 1970s, researchers have publicized the potential of a “hydrogen economy,” in which hydrogen would swap gasoline to fuel ground transportation. When burned, hydrogen’s only derivative is water, making it environmentally cleaner and more energy efficient than its fossil-fuel alternatives. Pure hydrogen gas, however, is very uncommon within the Earth’s atmosphere. Water (or steam) splitting could efficiently and cleanly yield enough pure hydrogen to make the hydrogen economy a real possibility. To split hydrogen from oxygen, researchers use heat produced by solar radiation and cerium oxide, or ceria. Sunlight is used to heat ceria between 1,000 °C and 1,500 °C, which drives a series of reactions that cause hydrogen to split off. Wolverton and others earlier knew that entropy was crucial to making this reaction happen, but they were incapable of finding the source of cerium’s entropy. Most people thought entropy was caused by mixing oxygen or vibrations from the heat, but we found that it’s a different source, and it’s not what you might think. In order for the chemical reaction that triggers water splitting to be useful, cerium in the oxide should gain an electron. And that single electron brings about whole lot of entropy. Cerium’s group of elements — referred to as rare earths — naturally have more electron states around which the electron can travel. Wolverton’s team computed the electronic entropy of all 17 rare earths and found out that cerium exhibited the largest amount.